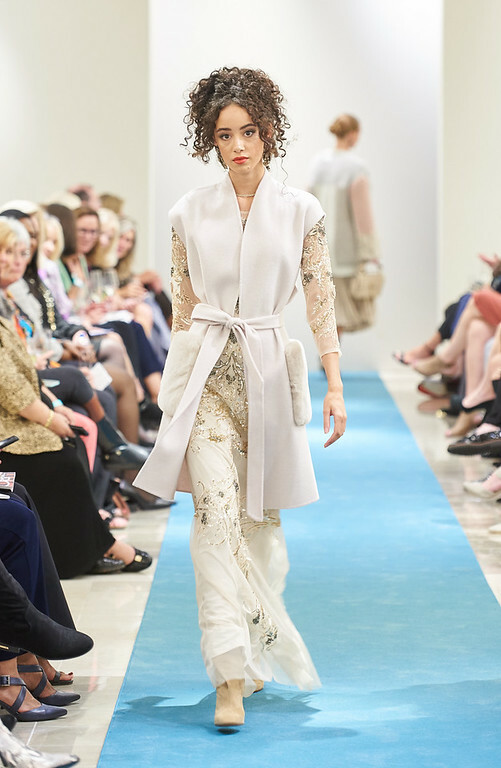 The O Report presented Spring Trend Report: An Elegant Evening of Fashion & Beauty for Women 50 & Up. hosted by St. John Boutique at SouthPark Mall. 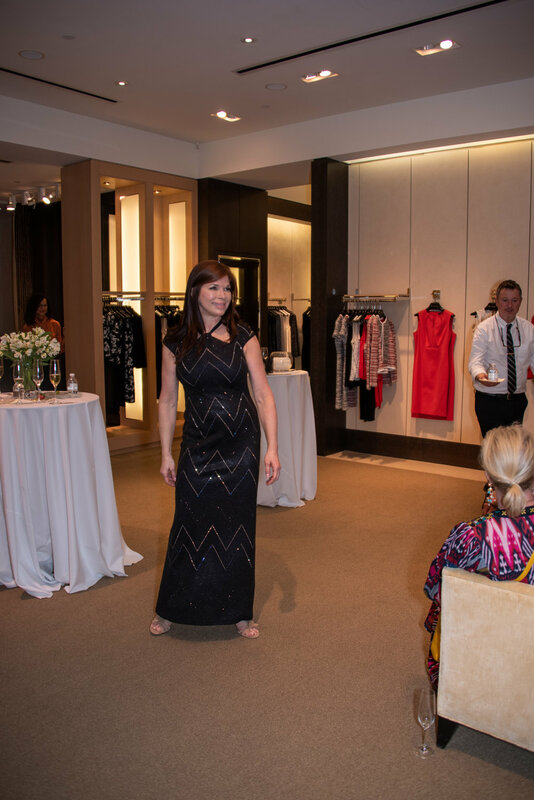 Guests learned about fashion trends for Spring 2019 and how to wear them. Models of different ages including 50 & up showed off Spring looks from the classic American luxury fashion brand St. John. Plus, award-winning surgeon Dr. Kevin Smith of Charlotte Plastic Surgery shared the newest surgical and non-surgical procedures and products that are revolutionizing the beauty industry. 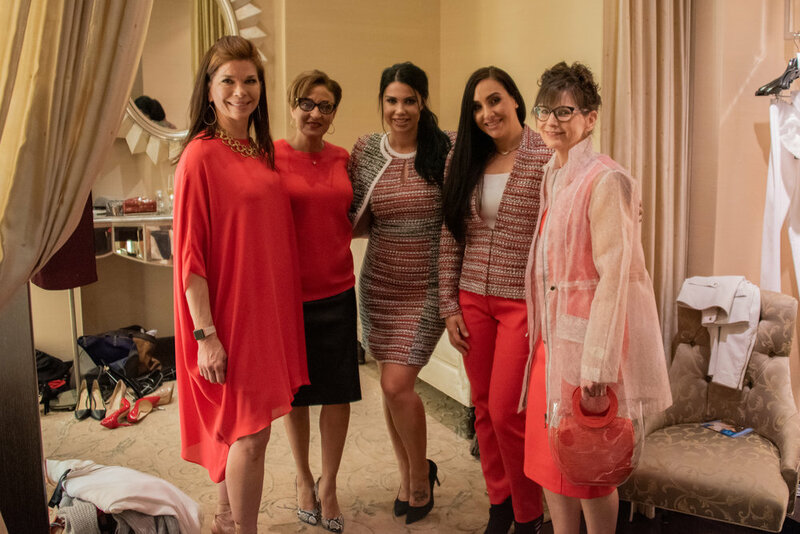 Along with the talk and informal modeling, guests enjoyed heavy hors d’oeuvres, sweet treats, Champagne cocktails, door prizes, gift bags and everyone received the newest edition of The O Report magazine. Please join The O Report for the Spring Trend Report: An Elegant Evening of Fashion & Beauty for Women 50 & Up. Hosted By St. John Boutique in The Luxury Wing Of SouthPark Mall, it’s a chance to learn about fashion trends for Spring 2019 and how to wear them. Models 50 & up will show off Spring looks from the classic American luxury fashion brand St. John. Dr. Kevin Smith of Charlotte Plastic Surgery will discuss revolutionary new trends in beauty during a Spring Trend Report on March 14 at the St. John Boutique at SouthPark Mall. Plus, award-winning surgeon Dr. Kevin Smith of Charlotte Plastic Surgery will share the newest surgical and non-surgical procedures and products that are revolutionizing the beauty industry. Enjoy heavy hors d’oeuvres, sweet treats, Champagne cocktails, door prizes and gift bags. Guests will be among the first to receive the newest edition of The O Report magazine. An LBD with sleeves. Seventy Black Crepe Dress, $365. 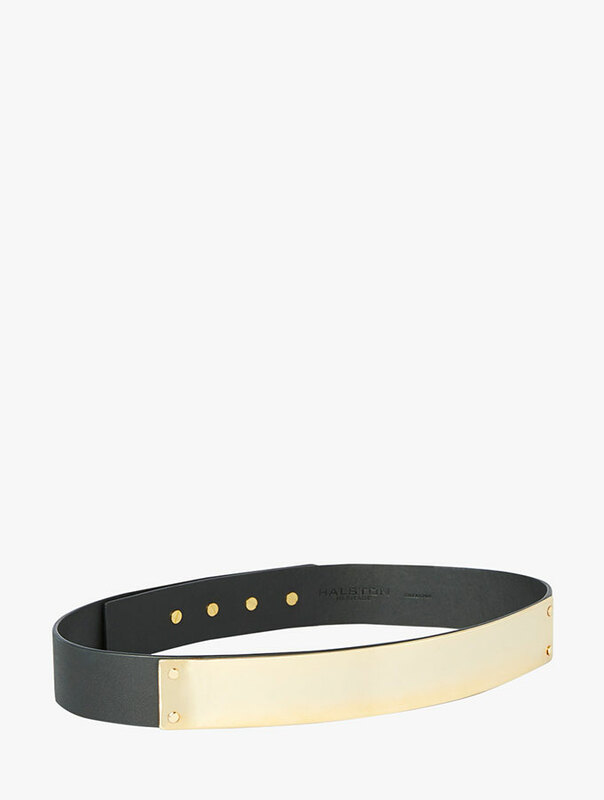 A piece of jewelry that catches the eye and adds interest to any outfit. Julie Vos Penelope Gold Shell Pearl Earring, $148. A two-piece tweed set that works beautifully on its own or when paired with other pieces. Max Mara Zurigo Sky Blue Cotton Tweed Dress, $425. A two-piece tweed set that works beautifully on its own or when paired with other pieces. 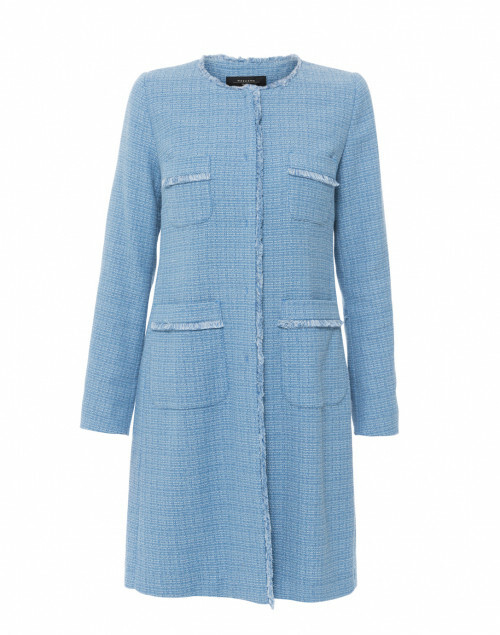 Max Mara Ottico Sky Blue Tweed Coat, $575. A crisp white button-down that looks great tucked or untucked. Les Copains White Button Down Poplin Shirt, $465. A form fitting sweater in a neutral color that works on its own or when layered under a jacket. Joseph Camel Lurex Merion Wool Sweater, $365. A go-anywhere handbag that’s durable yet timeless. Alexandra de Curtis Midi Ruched Navy Tote, $669. Halsbrook, an online retailer focusing on unique, high-quality clothing for the 50 and up market, says these are the seven key pieces that every woman needs in her wardrobe. A piece of jewelry that catches the eye and adds interest to any outfit. A two-piece tweed set works beautifully on its own or when paired with other pieces. A crisp white button-down that looks great tucked or untucked. A form fitting sweater in a neutral color that works on its own or when layered under a jacket. A go-anywhere handbag that’s durable yet timeless. 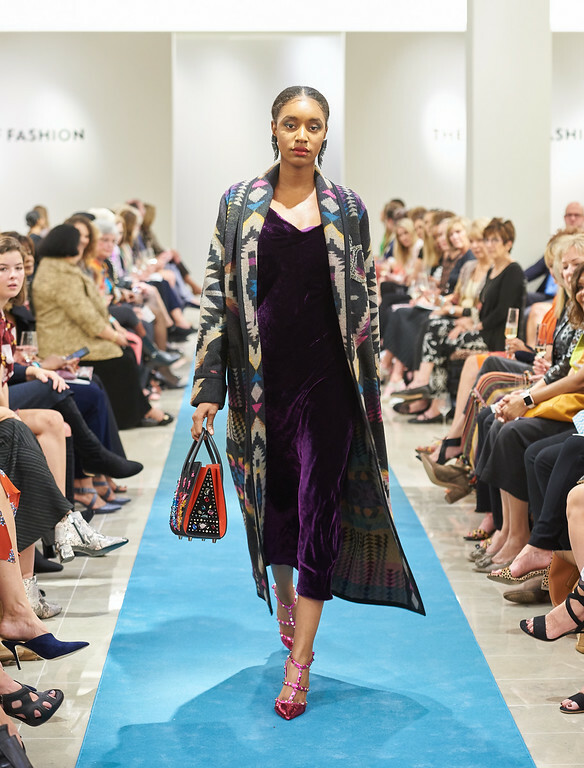 Neiman Marcus of Charlotte’s The Art of Fashion benefit for The Mint Museum featured a runway show of bold new styles from luxury designers including Valentino, Gucci, The Row, Akris, Dolce & Gabbana, Etro, Moncler, Chloe, Tom Ford and Michael Kors Collection. For photos of all the glamorous guests, go to the Social section. To see the runway looks for men, go to the Men’s section. Vince Camuto Aryna Tote, $88. Dillard’s. Football season is here, but the rules have changed. Now clear bags are required for many sporting events and arenas. Some women have resorted to carrying their essentials in plastic storage bags. You’re too chic to be that desperate! That’s why we love these stadium-approved bags from Vince Camuto. Suitable for any style-setter, the bags come in two versions, a tote and a cross-body. Both have faux leather trim available in different colors, plus handy pockets. Vince Camuto Aryna Cross-Body Bag, $58. Dillard’s. Items at Goodwill's new GW boutique are organized by color in chic displays. Charlotte's hot new boutique, GW, just opened June 8 and it's destined to be a hit. Although it looks like it could be in a high-end shopping center, it's on Wilkinson Boulevard at Goodwill's shiny new Opportunity Campus, hence the name GW. GW boutique sells the best clothing, accessories and home decor donated to Goodwill Industries of the Southern Piedmont. Tonya Nations, vice president of store operations, gave us a tour and we were impressed with the merchandise and the mission. It's filled with some of the best clothing and home decor items donated to Goodwill displayed in a color-block style similar to the popular chain store Charming Charlie. Clipboards with sheet music make a clever display for jewelry at the new GW boutique. The prices generally range from $3 to $24, but some top designer items can be $50 and up. The boutique is run by a team of professionals with a retail background that includes Belk and Nordstrom. It's also a job training site where those who are helped by Goodwill can learn about working in retail. True bargain hunters will also be interested to know that the space next to GW is devoted to a new outlet store called Second Editions. It has bins of deeply discounted clothing, plus shoes, jewelry, books and items for the home that are pulled from other Goodwill stores because they weren't snapped up within three weeks. GW Boutique and Second Editions are at 5301 Wilkinson Boulevard. Hours are 9 a.m. to 9 p.m. Monday-Saturday; 10 a.m.-7 p.m. Sunday. For details, click here. The designer launched Roberta Roller Rabbit in 2003 after sensing women were craving more relaxed, bohemian-inspired clothing that was chic and looked good on a variety of body types. It's no wonder she hit the kurta on the head. A look into her past success at predicting fashion's next big thing is pretty amazing. A New York Times article from 2010 credits her with being a "pashmina pioneer" in the mid-1990s and more recently for popularizing the jeweled bib necklace trend by creating a sensation with her bold necklaces made of multicolored stones. Roberta is a native of London whose mother was a famous model and muse for Balenciaga and Jaques Fath. During the trunk show, she shared some musings of her own about Charlotte women and the one color you should keep away from your face. Why do you think Roberta Roller Rabbit has been such a success? "Because it's comfortable and it's very feminine, but it's not frumpy." You've lived and traveled all over the world. What do you think about women in Charlotte? "I love Charlotte women. They are so charming and like me, they love color." What's one of the main things you learned about fashion from your mother? "My mother was extremely elegant. She died at 101. She told me to never wear black - it's no good for the face." The brand's rise to popularity began with one item on the top of almost every woman's wardrobe wish list: A great fitting pair of pants. A built-in mesh panel for tummy control and a variety of on-trend styles and patterns to choose from keep customers coming back for more. Now the line also features skirts, tops, dresses, blazers, accessories and the athletic-inspired Lisette L Sport. Limoges, 66, was in Charlotte following a business trip to Charleston as one of the sponsors of the Family Circle Volvo Cup Classic tennis tournament where she met two famous fans of her designs - South Carolina Governor Nikki Haley and Martha Stewart. Q: Why do you think women of all ages have responded to your designs? A: Every woman is on the go and they want to look good and feel comfortable. Whether you're traveling or staying at home, the clothes feel good and they're wash and wear so they're easy. Q: Are there certain ways to wear the collection depending on your age? You have to take the pieces you love and adapt them to your body. Kathryne is wearing her pants with a fitted, shorter top. I'm wearing mine with a tunic top (the Adele 31-Inch Tunic Pull-On Blouse). It's a wardrobe staple. I have it in white and black. Q: What is one of the biggest trends for fall? A: Gauchos are still coming on strong. And wearing a matching top and bottom. Kathryne is wearing that look today with her matching blazer and pants. But then she'll also break them up and wear them with other pieces. Q: What is your best fashion advice? A: You have to feel good to look good. It all starts inside. Charity League of Charlotte, one of our city's longest-operating nonprofits, has helped children in the community since 1921. Its biggest annual fundraiser is a Fashion Show and Silent Auction Luncheon at Carmel Country Club. This year's event took place on St. Patrick's Day, so guests were lucky to see a performance by Rince na h'Eireann School of Irish Dance. WBTV anchor Molly Grantham was emcee of the fashion show that featured spring and summer essentials from Talbots at Specialty Shops on the Park and adorable cotton dresses for girls from Poppy Whitaker. Classic pieces for spring and summer from Talbots at Specialty Shops on the Park. Pretty little dresses with clever details from Poppy Whitaker. We've always admired the work of legendary American fashion designer Halston (1932-1990), and now we're also wild about the designs coming from the Halston Heritage brand that carries on his name. The current owners of Halston Heritage have managed to keep Halston's vision of relaxed luxury and 1970s glamour, but recreate it for our modern lives. Just like the disco anthem from Halston's Studio 54 heyday, we just keep wanting to buy "more, more, more" of the collection. Here are some of our favorite looks. To view all the offerings, click here. Cashmere Blend Poncho Cardigan, $375. Slim Boot Linen Pant in white or black with a side slit at the hem that can be worn opened or closed, $275. Jacqueline Suede D'Orsay Shoe, $295 (also in silver metallic leather, $245). Sequined Cover Up (also in black), $295. Silk Faile Structured Evening Skirt, $595. Organic Minaudière (one side is black, the other is white), $345. Rectangular Minaudière, $395. Lucite and Metal Large Box Minaudière, $495. Printed Draped Blouse, $275. Georgette Insert Poncho (also in black), $275. Pleated Poncho Top (also in black), $325. Cape Trench Coat, $495. Wide Plaque Belk, $155. Elsa Large Slouchy Hobo Bag, $550. It's here, and it's more fabulous than we imagined. Kate Spade, the real woman who built the Kate Spade New York brand (and then sold it), and her husband, Andy Spade, have started over fresh with a new line of Italian-made shoes and handbags called Frances Valentine. 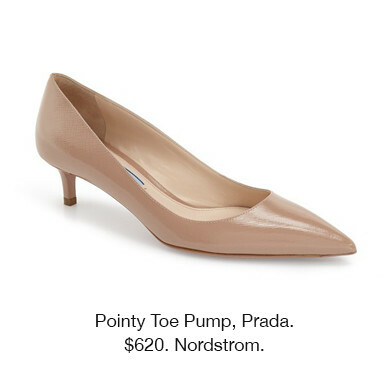 It just launched March 1 - perfect timing since there are plenty of brightly colored patent leathers, floral fabrics and gorgeous metallics to choose from. Her mix of modern whimsy rooted in classic design has us seriously crushing on this collection. Bajra shawls, $895 each, bring light to your face. Charlotte is on the international fashion map thanks to Capitol boutique owner Laura Vinroot Poole. Her expert eye and knack for discovering new designers fuel the fashion dreams of her impressive list of customers. They adore her and her staff for their talent and wonderfully obsessive attention to customer service. Poole and her team attend A-list fashion shows at home and abroad to bring the best back to their chic clientele. So when she talks style for the 50 and older set, we listen. Most surprising confession: "I don't follow trends. I never have. I have no idea what the color or style of the moment is. I just don't think that way." Biggest misconception about Capitol: "Throughout my career, I've had some women walk in and say that it's a young person's store and there won't be anything that will fit them. Mainly young women work here, but It's not that kind of a store. Most of my customers are in their 50s and 60s. A salesperson doesn't have to be your age to be able to help you. Working with someone who's not in your age group can help you get out of a rut." A great fit: "Find someone to help you who's not a friend or a relative. A great salesperson can help make you look more like your true self. They can help you navigate all the styles and give you the confidence to update your look." Handcrafted Yaser Shaw shawl, $1200. European inspiration: "Especially in Paris, the women all have shawls. It's amazing how a great shawl can keep you comfortable in all sorts of climates. I wear one almost every day. It sounds weird, but even in the summer a shawl can help shield you when it's hot. And I love a shawl for evening. It adds a little mystery." Best tip: "Always think about bringing light to your face. Pearls are famous for that. It's also part of the beauty of a shawl or a great pair of earrings - to bring color near your face." 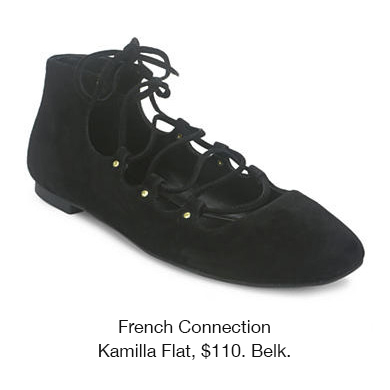 Aquazurra Lace Up Flats, $685. Flats are where it's at: "A great flat will change your life. No one is going to be tricked into thinking you're taller because you wear uncomfortable high heels. When you're comfortable, you look more like yourself." Biggest change: "Women buying jewelry for themselves has become a big part of my business. The old-fashioned idea was that men buy jewelry for you. Now women buy it for themselves." Deborah Williams, president of Professional Consultant Group, is out and about a lot while meeting with clients or attending events. But for those days she's at home working on her computer, she shared her solution for being cozy and chic: UGG Australia's Isla cardigan and Andrie pants. "They're both so soft and warm," she says. "And you can run out to the mailbox in them and still feel stylish." "The Isla cardigan ($98) is made of soft fleece and comes in two colors. The Andrie pant is no longer available online, but try the Oralyn pant ($75) which is made of cotton jersey lined with fleece and comes in four colors; or the Farah legging ($78) that's made of fleece and comes in three colors. Carine Roitfeld, 61, is a Parisian-born former model who has become one of the fashion world's most influential tastemakers. On Feb. 11, she launched her second collection forJapanese fast fashion label Uniglo. Titled Uniglo X Carine Roitfeld, it features dresses, pants, tops, jackets and accessories with Roitfeld's mix of feminine and edgy flair. Standouts are military blouson jackets along with elegant knee-grazing skirts in three different styles: pencil, wrap and ruffle. If you want to order, hurry. Less than 24 hours after launching, the site is already low on stock: Uniglo. MILITARY BLOUSON IN OLIVE, 69.90. ALSO AVAILABLE IN OTHER MATERIAL AND COLORS. RUFFLE SKIRT IN BLACK, $49.90. WRAP SKIRT IN KHAKI (SHOWN); ALSO AVAILABLE IN NATURAL AND OLIVE. $49.90. BLACK JACQUARD PENCIL SKIRT WITH A CROCODILE DESIGN, $49.90. Doncaster is known for its beautiful, quality clothing worn by sophisticated women around the country. It's also one of North Carolina's great family-owned businesses that has thrived since it was founded in 1931 in Rutherfordton. Its business model is to sell directly to consumers through a nationwide network of wardrobe stylists. The stylists will be showing Doncaster's Spring line through Feb. 12. Marguerite Rupar, one of Charlotte's Doncaster stylists, invited us to her Dilworth studio for a look at the new offerings of custom-fit pants and jeans along with elegant dresses, jackets and tops. Details: 704-370-0433; www.doncastercharlotte.com. The classic blazer gets an update with notched lapels and origami-like folds that add interest, not bulk. In Twine (shown) and Navy. $450. A "bubble" pattern adds fun to this coat that looks equally great dressed up or down. In Sunset (shown) and Twine. $795. An inverted pleat on the blouse and the flare of the skirt are modern yet forgiving. In Navy (shown), White, Black and Crimson. Blouse, $225; skirt, $250. A subtle zebra print in gold and white adds style to this elegant, and versatile, jacket ($650) and dress ($395). The jacket is also stunning with white pants. It seems the lower the heel, the more in step with modern fashion you are. 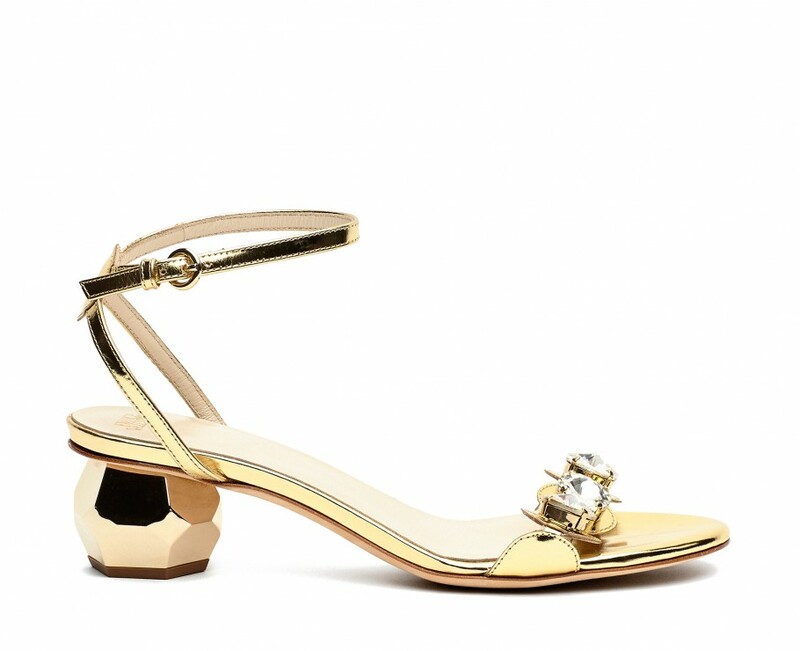 Taking a cue from fashion runways, retailers are offering more stylish options for lower-heeled, and flat, shoes than in recent memory. That’s great news for those of us who either need a break from our higher heels, or have shunned them altogether. Here are five that work day or night.